Our last lesson had David’s son, Absalom, trying his best to take the kingdom away from his father. David was chosen by God, anointed by Samuel, and placed on the throne through circumstances that show the Lord wanted him there. Absalom didn’t ask the Lord. He wanted the position and didn’t care how he got it. He is proud and conniving. The last lesson if you missed click here. David loved his son and is hurt by what Absalom is doing. One of David’s friends, Hushai, helped David by giving advice to Absalom against the advice he was getting from Ahithophel. Absalom listened to Hushai, which is what the Lord wanted him to do. Hushai sent word to David through the Priest, Zadok. Two men, Jonathan and Ahimaaz, were to take word to David. They would get the messages from a servant girl. A young man saw them get the information and told Absalom. Absalom sent men to capture these two. Ahimaaz and Jonathan went to a man’s house who had a well and climbed down into it. The man’s wife put a covering over the well and then scattered grain over the top. No one knew anything about this. When Absalom’s men got there looking for the men they were told the men had left and the search revealed nothing. After the men were gone, the two men climbed out of the well and rushed to tell David to cross the river at once. David, along with all the people that were with him, crossed over the river. It took all night but by daybreak all were safely on the other side. In this way, Absalom did not get to sneak an attack against David and his people. The people in the area loved David and took food and blankets to David and the people with him. The Lord was providing for David though these people. Absalom was bent on destroying David. David knew there was going to be a battle over the kingdom. He put his army together in three groups with three men in charge. He told them to be gentle to Absalom. David didn’t want his son killed. All the men heard this from David. David was ready to march out with his men but his men were afraid harm would come to him and didn’t want him to go with them. David agreed and stood by the gate and watched them depart to fight. A great battle ensued. David’s men defeated Absalom’s army with twenty thousand casualties. The forest was dense and helped in bringing the enemy down. Here is where it gets bad. Absalom sat upon a donkey in the fight and in the dense forest he rode under the trees. Unfortunately, he didn’t duck low enough and his head of hair got caught in the branches. His donkey kept going. He was helplessly hanging there. A soldier of David’s army saw him but left him there. He told Joab, David’s most trusted warrior and in charge of a third of the army, that he saw Absalom hanging in the tree. Joab was angry that the soldier had not killed Absalom. The soldier reminded him that David had told them to protect Absalom. 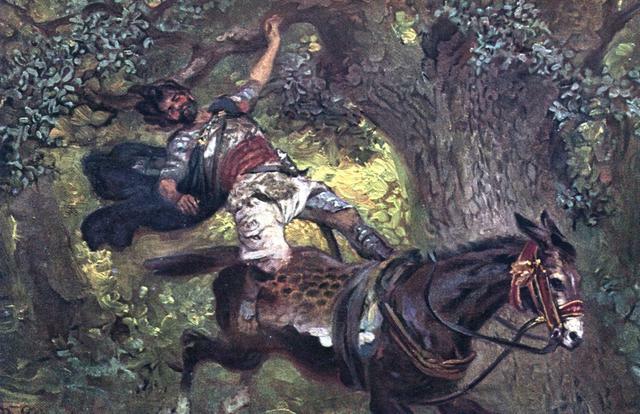 Joab took three javelins with him and plunged them into Absalom’s heart while he was alive hanging in the tree. Then, they took Absalom’s body and threw it into a pit and covered it with rocks. Joab blew the trumpet sounding the end of the battle and the enemy fled. When David learned that his son was dead, he wept and wailed, “O my son Absalom—my son, my son Absalom—if only I had died in your place! O Absalom my son, my son!” 2Samuel 18:33b. David wept a great deal because his son was dead. He loved his son even though Absalom was trying to take everything away from David, his father. We should be so generous to our families, friends, neighbors, and even our enemies. 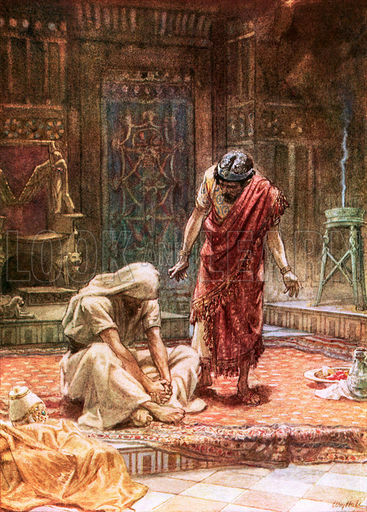 We need to forgive those that hurt us—like David did to Absalom. This was a terrible time in David’s life, yet he didn’t sin. He loved and forgave. This is a lesson we all should heed. Don’t be mean to ones that hurt us. We need to forgive those that hurt us. Please memorize: Matthew 6:14 For if you forgive men their trespasses, your heavenly Father will also forgive you. Trespass means an act of causing injury to a person, property, or rights of another, committed with force or violence.